20 FREE 5X7 Photo Cards From Walgreens! 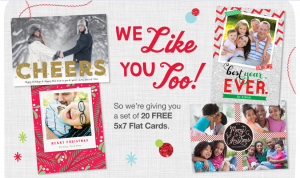 You are here: Home / freebies / 20 FREE 5X7 Photo Cards From Walgreens! Walgreens has a HOT promotion a morning! They are giving away codes for 20 FREE 5X7 photo cards! There are only 10,000 codes available, so grab this one while you can! I just got mine! NOTE: You will need to “like” the page to get the code. This is a Facebook-based app and may not work well on some mobile devices. 3. Select in store pick up so you don’t have to pay for shipping. The code is valid through 12/7. 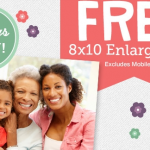 FREE 8X10 Photo Enlargement from Walgreens! Walgreens: FREE 4.5X6 Photo Brag Book! 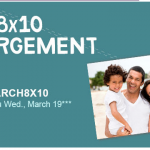 Walgreens FREE 8X10 photo enlargement!